You can save money and provide your family with amazingly nutritious food by building your own aquaponics system, and in this article I will show you how to get started. First I will explain why I think it’s important to take the time to understand and build a DIY system. Then we’ll explore the basic design concept of any system and how to expand on that and implement it for your specific needs. And of course I will also go over the components and materials needed, and where to get them. Next up we’ll tackle the issue of the size and location of your garden, and to finish it off I will provide further resources for detailed DIY plans if you feel like you still need additional help with setting up and operating your aquaponics system. I hope you find this guide helpful and easy to follow. If you have any question please don’t hesitate to get in touch. Also please make sure you bookmark this, and share it with your friends if you like! Remember: With a little bit of determination, anyone can do this! Why Build Your Own System? For many people cost is going to be a concern and this is one of the primary advantages to going the DIY route: you gain considerable savings by taking things into your own hands. Depending on the scope of your plans you can save 50 to 75% or even more if you get really creative & resourceful with your supplies and materials. By planning & designing a system and putting it together yourself, you end up re-enforcing a solid understanding of how an aquaponics system works. And this allows you to take true ownership of your system and its operation. This means that any future work will be a snap because you know your setup intimately and making additions, changes, or repairs will be second nature. And last but not least, there’s that sweet satisfaction of a job well done. If you’re anything like me then you revel in the feeling of successfully completing a project started from scratch and followed all the way through. Especially one that will provide an abundant supply of healthy organic food for you and your family for years to come. Before moving on to more intricate designs and layouts it helps to visualize an aquaponics system in its most basic configuration. If you look at the diagram below you can see that I’ve labeled the primary components of any system. How you decide to arrange them, what size they will be, and where you will set them up will vary from system to system of course. As you can see, the core concept is extremely simple. Water flows from the fish tank (A) to the garden (B). And then from (B) back to (A) again. The secondary components (c, d, & e) facilitate the movement and distribution of water between the two primary components. This. 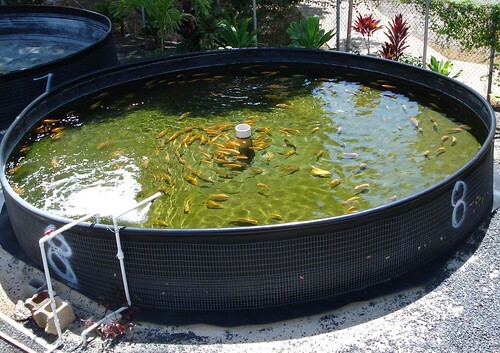 In its most basic sense, is all an aquaponics system is. And although you might feel that this is too simple, remember that you can expand on this core design and implement it for your specific needs in an almost infinite variety of ways. There are varying degrees of size and complexity when it comes to designing and constructing your aquaponics garden, but there are some common components of any system, and it helps to understand what they are and how they work. Fish Tank: This is the main tank in which you raise and feed your fish. The waste from here accumulates and is pumped into the garden where it nourishes your plants and helps them to grow. Garden: This is where you grow your plants. It has its own watering system which is provided with water & nutrients from the fish tank and there are different strategies for how to set this up. For instance you can use media filled beds which receive a continuous flow of water, a flood and drain system, or even a deep water culture system which allows the plants to simply soak their roots directly in the water below. Sump Tank: This is the lowest point in an aquapotics system, and it’s where the water is collected from the garden before it returns to the fish tank. This is a non essential component but using one comes with some advantages. Not only does it allow you to maintain a constant water level in your fish tank, but it allows you to easily remove collected and unwanted waste before sending that water back to the fish tank. Your pump also operates much better with cleaner water, so this ensures that your fish tank pumps water to your garden at a consistent rate. Pump: This is the workhorse of your system, it moves and directs the flow of water from each area of your aquaponics garden to the next. The key thing to keep in mind when growing indoors is that you need to choose an area that receives at least 4 to 6 hours of sunlight per day, this is the minimum required for most plants to grow properly. With that said, any place in your home that meets the minimum requirements for sunlight is perfect for setting up a small aquaponics system. And of course you can always use a hydroponic grow light if getting adequate sunlight is a problem. When it comes to outdoor growing, the logical solution for most people is their backyard. Not only does this give you privacy and security, but it also provides adequate space for any future expansion. It is not uncommon however to see people with systems at the side of their house or even in their front yard. A lot of it dependson where you can get the right amount of sunlight for your garden. The possibilities for the size and location of your setup are endless. Small, big, indoors or outdoors… Whatever your current situation, you can definitely get your own aquaponics system up and running! If you’re ready to get started then I highly recommend you choose a step-by-step guide or course to help you. There are some excellent online video courses which will ensure the success of your project and make the process easy, smooth, and fun. In my opinion this is the best way to build your DIY system. Websites & Books are great, but nothing beats high quality step-by-step video instruction. To see which guides & courses I recommend to my readers please click the green button below! Aquaponics puts you in control of providing you and your loved ones with healthy, organic, nutritious, and abundant food for the years ahead. If you’re ready, then there’s no better time to start than right now!